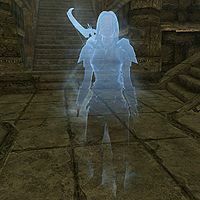 Katria is a Nord spirit who is encountered at the beginning of Arkngthamz. She can initially be heard pleading you to leave the area, and after a while will appear and warn you of the dangers ahead. Katria will explain that she spent her life tracking down the legend of the Aetherium Forge, and that her apprentice stole everything from her and published it all under his own name. Later in the quest you will stumble across her bow, the Zephyr. She will ask you to keep the bow and put it to good use. During the quest, you will see her each time you collect one of the Aetherium Shards; once you have found all of them, she meets you at the Aetherium Forge. Once you finish the quest, she will thank you and then disappear from the game. Katria's gear can be changed at the start of the Lost To The Ages quest by canceling out of her initial conversation then using Ice/Paralyze/Force as she walks away to perform a reverse pickpocket. Her bow cannot be upgraded, however. 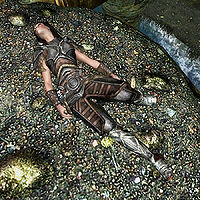 Katria's corpse cannot be reanimated. If you take the armor from Katria's body, her ghost will comment, "Really? You had to take the armor? Come on, leave me with a little dignity...". She is essential, but if her health is reduced until she has to kneel down and recover, then, when she has recovered, she will scornfully ask you, "That make you feel any better?". She is voiced by Lani Minella. She uses an ethereal version of her bow even though she lost it elsewhere in the ruins. Despite technically being undead; Katria is unaffected by Detect Dead and undead healing spells, whereas she is affected by Detect Life and regular healing spells.